Hercules High And Mighty is a casino slot game from developer SG Gaming. 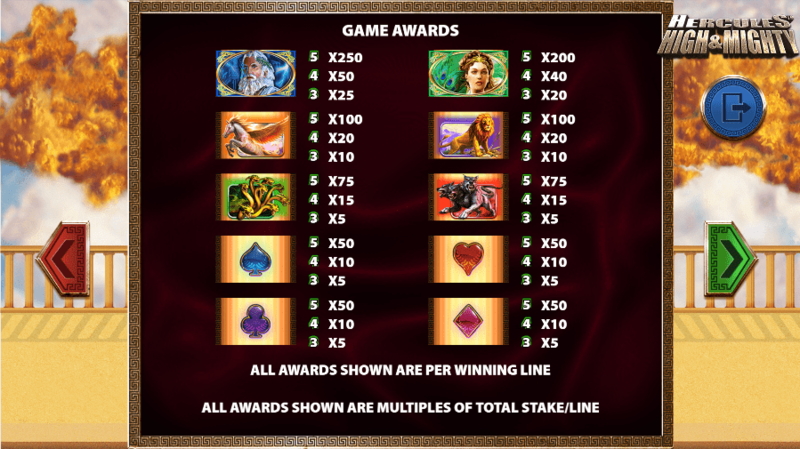 Based on the classical legend of Hercules and his amazing tasks, the game has five reels, 10 rows and 50 fixed paylines to give you plenty of entertainment. The Return to Player percentage varies between 94 percent and 98 percent, depending upon which online casino you are playing in, so keep an eye out for that if you decide to give the game a spin. The game’s graphics deploy plenty of images from the legend of Hercules. These include the Nemean Lion, the Lernaean Hydra and Cerberus, the three-headed dog. Gods like Zeus also make an appearance. Lower value symbols on the reels are the four playing card symbols. The Pillars of Hercules are also depicted on either side of the game’s reels. Hercules himself is the game’s expanding wild symbol, and he substitutes for any symbol apart from the scatter. The game’s scatter symbol is a gold coin. If three of these land anywhere in view, you will receive eight free spins. For four scatters, you get 12 free spins, and for five scatters you receive 20 free spins. If you spin in more coins during the free spins, then you can receive even more free spins. An additional chance to win big prizes is given by the game’s Big Bet bonus feature, which offers five special spins if you increase your stake size. The three Big Bets available are £20, £20 and £50, and all involve Hercules becoming an expanding wild. Lower value symbols are removed in this part of the game, and you get the chance to win some really big prizes. Follow this link to discover more. This game was developed by a company called SG Gaming, which is a division of Scientific Games Corporation. A British company, SG Gaming came about when two other brands were combined – Barcrest and The Global Draw. The Barcrest logo will be familiar to anyone who enjoys playing fruit machines in a UK casino, as it has been around since 1968. That was when they started making analogue fruit machines for the UK market. The advent of digital technology saw the company expand even further, growing in continental Europe too. In 2006, Barcrest produced the Rainbow Riches brand, which has gone on to become an iconic part of their range. In 2011, Barcrest was acquired by Scientific Games, ensuring that the brand’s heritage and reputation for providing high-quality gaming experiences would be passed on. If you enjoy playing jackpot slots game online, you will find plenty to appreciate in Hercules High and Mighty. The bonus features are great if you like games where the prizes get massive boosts. The game has some nice graphics too, and the ancient world theme is a lot of fun. Gameplay is smooth, and the music helps things along nicely enough. 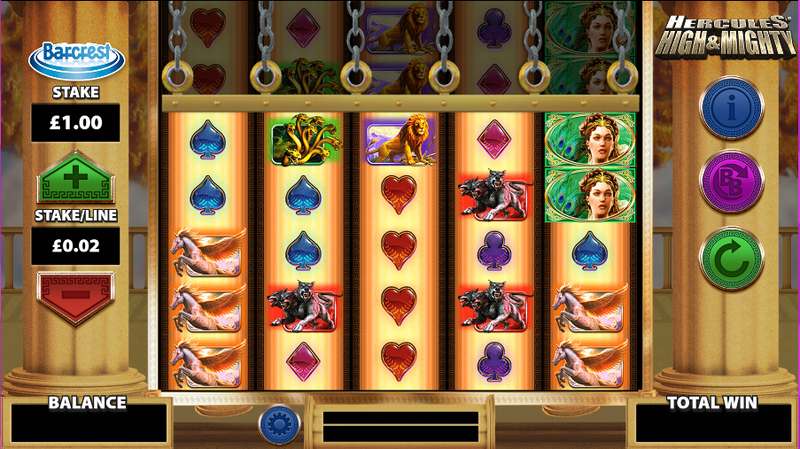 Hercules High and Mighty is certainly worth some of your time if you are slots fan.